Located in the heart of Bangkok the 3 Howw Hostel is perfected situated to enjoy all that Bangkok has top offer. Our hostel is brand new with a modern design and cozy atmosphere. You can meet friends from around the world swap stories and our staff are happy to help you plan your trip around Thailand. You can enjoy our open plan common area with free wifi internet, books and movies you wil be more than catered for. Inside our comfortable rooms there is air conditioning fresh linnen all finished to a clean comfortable standard with shared or private rooms. 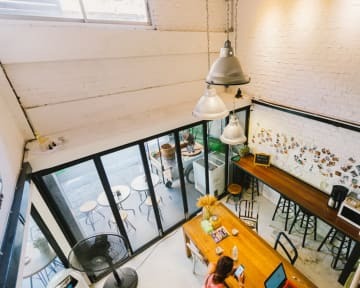 The hostel is just 5 minutes walk from Khao san road and many other tourist attractions such as the Grand Palace, National Museum and magnificent Thai temples. In the evening you can enjoy the fine restaurant and bar with live music by Chaopraya River on Phra-artid road. 316/5 Samsen Soi 4 Phanakorn, Khao San Road, Bangkok. - Free Wi-Fi internet throughout the building. - Free use of iron and ironing board and kitchen area. - Free shampoo, shower gel, hair dryer in every bathroom. - The hostel requires 300THB security deposit upon your arrival for checking-in. And this deposit will be refunded when you check-out.